In the Second Chapter, verse 39, the Lord explained two kinds of procedures—namely sankhya-yoga and karma-yoga, or buddhi-yoga. In this verse, the Lord explains the same more clearly. 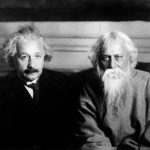 Sankhya-yoga, or the analytical study of the nature of spirit and matter, is the subject matter for persons who are inclined to speculate and understand things by experimental knowledge and philosophy. The other class of men work in Krishna consciousness, as it is explained in the 61st verse of the Second Chapter. The Lord has explained, also in the 39th verse, that by working by the principles of buddhi-yoga, or Krishna consciousness, one can be relieved from the bonds of action; and, furthermore, there is no flaw in the process. The same principle is more clearly explained in the 61st verse—that this buddhi-yoga is to depend entirely on the Supreme (or more specifically, on Krishna), and in this way all the senses can be brought under control very easily. Therefore, both the yogas are interdependent, as religion and philosophy. Religion without philosophy is sentiment, or sometimes fanaticism, while philosophy without religion is mental speculation. The ultimate goal is Krishna, because the philosophers who are also sincerely searching after the Absolute Truth come in the end to Krishna consciousness. This is also stated in the Bhagavad-gita. The whole process is to understand the real position of the self in relation to the Superself. The indirect process is philosophical speculation, by which, gradually, one may come to the point of Krishna consciousness; and the other process is directly connecting with everything in Krishna consciousness. Of these two, the path of Krishna consciousness is better because it does not depend on purifying the senses by a philosophical process. Krishna consciousness is itself the purifying process, and by the direct method of devotional service it is simultaneously easy and sublime. For those who are not able to ascend to the platform knowledge by a pure heart, there is a means to ascend to platform. They are fixed or limited to niskama karma yog activities without desire, offered to me. They are known as the engaged in karma. Verses such as the following illustrate this yoga. The karmi and jnani are different in name only. Actually persons engaged in karma become pure hearted jnanis by the actions. And the jnanis become liberated by bhakti. This is meaning of all my words. 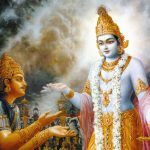 The Supreme Lord Krishna explains to Arjuna that he is looking at jnana yoga and karma yoga as two independent paths but He informs him that He has not stated this point of view. Lord Krishna has taught that both can give unadulterated devotion to the ultimate truth. Which yoga is superior or subordinate to the other is not a question as they each can attain the desired goal. They are two different paths to a singular destination suited to the ambiences of different aspirants. 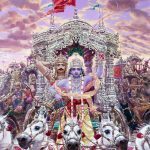 Lord Krishna, the omniscient one has explained very clearly in chapter two of the two classes of aspirants in the human race being the sinless of pure mind and the sinful of impure mind. Lord Krishna has explained that for purified minds jnana yoga or the yoga of knowledge is appropriate as in chapter two verse sixty-one states: the self controlled one sits in meditation on Him. 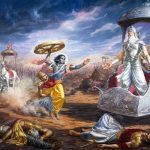 But for minds not yet purified karma yoga or the yoga of action is more suitable as in chapter two verse thirty-one states there is no greater fortune for a ksatriya warrior than a righteous war. Therefore in respect to the two paths they are actually two stages of the same path separated only by purity and impurity of mind. You have already been taught the requisite state of mind conducive to realisation of the soul in jnana yoga now learn of it from the point of view of karma yoga. 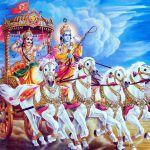 Even though jnana yoga or the yoga of knowledge may appear to be superior to him, anyway due to Arjuna’s ineligibility he is only qualified for karma yoga, the yoga of actions. Hence karma yoga is being recommended for him. The Supreme Lord Krishna states loke in this world there exists two types of humans who follow these two paths. Those who renounce the ordained activities of family life and society, to fully contemplate and meditate on the ultimate truth like Sanaka referred to by the word sankyanam and those who adhere to the ordained guidelines of family life and society and yet glean knowledge like King Janaka referred to by the word yoginam. Both types are firmly situated in righteousness. Even though those who are eligible for karma yoga perform actions for the protection and benefit of the worlds as willed by the Lord are also deemed as yogis, men of equanimity. Lord Krishna is informing Arjuna that he is ineligible to perform activities of renunciation like Sanaka and others but he is eligible to perform auspicious activities for the benefit of the world like Kind Janaka and others. This is the purport of this verse. The method which promotes spiritual knowledge is known as jnana yoga. Other methods are those which promote actions. The demi-gods as well as the renunciates are known as sankhyas because in them spiritual knowledge predominates actions. The demi-gods by dint of additional attributes even though engaged in the actions of universal management are more dominant in spiritual knowledge. Men of action even though possessing spiritual knowledge because of the predominance of activities are known as yogis. Without either spiritual knowledge or selfless actions neither could attain moksa or liberation. No being can even for a moment exist without performing actions and without spiritual knowledge one’s actions will never benefit one’s existence and lead it to the ultimate truth. This has been revealed in the Brahma Vaivartaka Purana. The word nishta means deep faith, abidance in this under direction of authorised guru leads to liberation without fail. Actions performed under such authorised guidance causes an increase of bliss and a decrease in inauspicious actions. The scriptural statements of the Vedas such as: not by actions and not by progeny, are not contradictory. If contrarily statements like : not by abstention of action had been made then there could be occasion for contradiction. In the same way a similar approach towards jnana yoga and karma yoga should be accepted. In this verse the emphasis of the two paths is that spiritual knowledge must be inherent in both indicating that jnana yoga is more suitable for moksa. Hari Om! Wisdom and equanimity have been discussed. Now karma yoga the yoga of actions is being specifically explained in this chapter. Far inferior is action in the search of enquiry. Here the word yoga attached to karma-yoga is being utilised as a means of acquiring wisdom in the performance of actions. Lord Krishnaâ€™s reply begins with O sinless one infering that Arjuna is fit to be instructed. But as you are doubting understand that the Lord did not prescribe two unrelated paths, karma yoga the yoga of actions and jnana yoga the yoga of knowledge. Lord Krishna states that in this world these are the two paths aspirants can take which lead to moksa or liberation. But they both depend upon qualification as jnana yoga is suitable for one type of human being and karma yoga is suitable for another type. What has been presented in the previous chapter was from the point of view of jnana yoga. There is a distinction to be found regarding qualification as there are yogis who have also cultivated knowledge while performing activities and realised the atma or soul by dint of their actions. Their minds becoming pure by meditation directly worshipping the Supreme Lord within their heart without desire for rewards as Lord Krishna states in chapter II verse sixty-one beginning with tani sarvani controlling all the senses. But those aspirants who have not acquired spiritual knowledge must purify their minds by the yoga of actions without desiring any reward. Then selfless actions like these can be utilised to cultivate the desire for spiritual knowledge. Lord Krishna states in chapter II verse forty-seven that we have the right to perform actions but not to desire the fruits. One should not assume that the distinctions in qualification is merely the differences between the aspirants because one may have an entirely different nature according to the situation. An example of this is a person overcoming death in the form of negligence by performing actions designated to overcome nescience as given in the Isavasopanisad II the text states: overcoming death with nescience one attains liberation through knowledge which means removing the impurities of the mind with knowledge which is caused by nescience and attain liberation. Following this line of reasoning the purport is that one is not qualified for jnana yoga as long as the desire for liberation is present. Only when the mind has become purified and is completely free from all desires by performing karma yoga without any desire for reward does one become qualified. So for this reason the Supreme Lord Krishna has presented this twofold spiritual path. In closing it should be understood that one who without performing karma yoga in their present life but is situated in jnana yoga cultivating spiritual knowledge, their purity of mind should be considered as a result of performing karma yoga in their previous birth and this is how they were able to attain jnana yoga so easily. Thus there is no contradiction in the presentation of the two in any way. śrī-bhagavān uvāca — the Supreme Personality of Godhead said; loke — in the world; asmin — this; dvi-vidhā — two kinds of; niṣṭhā — faith; purā — formerly; proktā — were said; mayā — by Me; anagha — O sinless one; jñāna-yogena — by the linking process of knowledge; sāńkhyānām — of the empiric philosophers; karma-yogena — by the linking process of devotion; yoginām — of the devotees.